Cardiff City hosts Chelsea in a game from the 32th round of the Premier League. Here are our thoughts about this match on Welsh soil on Sunday afternoon. Cardiff City continue their fight for survival. Right now the Welsh team is 18th in the league with 28 points, trailing on 2 points behind the 17th Burnley. Right now they are in the relegation zone, but nothing is lost just yet. If Cardiff manage to perform strong until the end of the season, they’d have pretty good chances to avoid relegation. In their last game in the league Cardiff stopped their run of three consecutive losses, beating West Ham United with 2-0 at home. David Hoilett and Victor Camarasa scored for the home team. Cardiff City can be satisfied, because they really needed this win in order to keep their chances of survival alive. Before this loss, Cardiff City suffered three consecutive losses against Watford, Everton and Wolverhampton. Chelsea are currently 6th in the league with 57 points, being on 3 points behind the 4th Arsenal and their big goal – the Top 4. Maurizio Sarri’s boys continue to be unconsistent in the league, winning only two of their last five matches in the league. With this kind of performance, for Chelsea it’s going to be very hard to return to the Top 4. In their last game the Blues suffered another dissapointment, losing with 0-2 their visit to Everton at the Goodison Park. Both goals were scored after the halftime break, when Richarlison and Gylfi scored for the Toffees. There were rumours that Sarri could get sacked after this defeat, but after all he’s still onboard at the club. 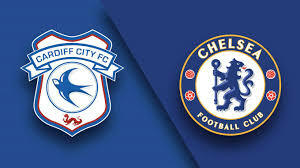 This game between Cardiff City and Chelsea is very important for both teams. Cardiff need points in order to survive, while Chelsea continue their fight for a Top 4 finish.